I Found My Favorite Book! I’ve never been able to answer simply the question, “What’s your favorite book?” I just have never been able to pin down a single book that stands out from the rest. 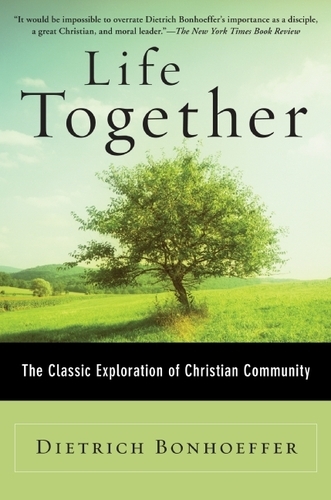 So it was a significant event in my reading life when, as I turned the last pages while sitting in the plane during our recent flight, I realized I had found my favorite book: Dietrich Bonhoeffer’s Life Together (Harper, 1954). This was actually the second time I read this book. I first read it two years ago, in preparation for a fellowship program that I didn’t end up doing (I got married instead!). The first time I read it, it was excellent. But it was as if I took a few bites, tasted it. The second time, I enjoyed the full meal, and it was so rewarding that before I finished it I was already anticipating the next time I would read it. Bonhoeffer – a German theologian and pastor who was murdered by the Gestapo for plotting to assassinate Hitler – wrote the book while teaching an underground seminary in Nazi Germany. He instructs on doing life together in Christ, as a community of Christians or as a family, and deals with topics such as prayer, common devotions, daily work, solitude, and serving one another. It’s a small book, running just over a hundred pages, but it is rich in wisdom and practical instruction. If you want to grow as a member of your community or your family, I cannot think of a better book you can read than this one. Here are three excerpts to pique your interest. More posts will follow. “Only he who gives thanks for little things receives the big things. We prevent God from giving us the great spiritual gifts He has in store for us, because we do not give thanks for daily gifts” (29). “Christian brotherhood is not an ideal which we must realize; it is rather a reality created by God in Christ in which we may participate” (30). “The exclusion of the weak and insignificant, the seemingly useless people, from a Christian community may actually mean the exclusion of Christ; in the poor brother Christ is knocking at the door” (38).